Objective: Join Wheely in a crazy adventure and see where the roads lead to. Change the mechanisms and use your skill to pass each challenge in the puzzle game. This funny car is really eager to see his beloved one once more. 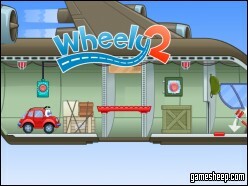 We are glad that you have chosen to play Wheely 2 on GameSheep.com, the most dynamic website available. If you like this game Wheely 2 don't forget to rate it and this way you will help with selecting only the best games for the home page.